Arbutus are a drought tolerant tree that come in three main forms suitable for the home garden. With good glossy green foliage and exceptionally attractive bark they make a good feature tree, or background tree for medium to large gardens. These are generally a medium sized tree, rarely reaching more than 7m in height. They form a spreading crown and the trunk develops a twisted appearance over time. A few smaller or compact cultivars are available, however difficult to find in Australia. The common name, ‘Strawberry Tree’ comes from the red rounded fruits that follow the flowers on most species. Evergreen shade trees with the additional benefit of flowers, they a tree that works well as a street tree. They grow well in cool to temperate climates, are reasonably drought tolerant once established and are not troubled by cold winters. Flowers resemble those of Lily of the Valley,small clusters of pale pink bells. Slow growing and nicely compact in habit Arbutus make an excellent specimen tree. A number of species and cultivars are available for sale from wholesale growers in various sizes. Arbutus pink pearls is a form of arbutus unedo. 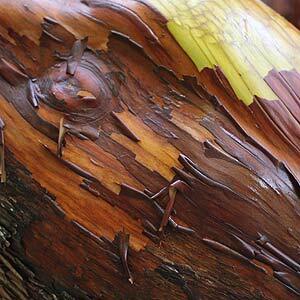 With outstanding bark colour arbutus are a great feature plant in the Australian garden. Also known as Canary Madrone and Greek Strawberry.